The Mechanical Services Division Controls Group offers customers a powerful answer to building monitoring and control. We make it easier to control heating, ventilating and air conditioning systems and their associated utility consumption. Flexibility in handling buildings in multiple locations and simplified future expansions are a few advantages we offer our customers. By automating the operation of your heating, ventilating, and air conditioning systems, as well as your building's lighting, a Direct Digital Control system from Herman Goldner Co., Inc. saves energy and ensures peak performance of your systems — 24 hours a day. 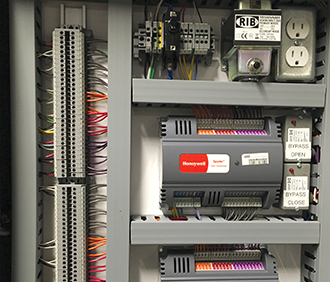 If cost containment, energy conservation, and occupant comfort are important to your building's management plans, consider the benefits of installing a Direct Digital Control (DDC) system in your new or existing building. Herman Goldner Co., Inc. installs building controls for your heating, ventilating, and air conditioning systems, as well as your building's lighting systems. All this can be controlled from a remote location and best of all, a DDC system saves energy and ensures peak performance around the clock. Herman Goldner Co., Inc. offers the Honeywell Excel 5000. Its modular system design allows for flexibility as your business or building needs expand. As an authorized Honeywell Automation Control Specialist (ACS), Herman Goldner Co., Inc. is one of the few select contractors qualified to engineer, install, and service the Excel 5000 system. We're fully trained and experienced in designing, installing, and servicing the Honeywell Excel 5000 system. Whether you're interested in upgrading an existing building or undertaking new construction, you can rely on us to ensure a successful installation and provide responsive local support afterward. Unlike other building control contractors, Herman Goldner Co., Inc. technicians are experts in mechanical systems as well, providing you with employees who are cross-trained in both electronic controls and mechanical systems.